The crochet world is very big and we are always looking for new ideas and new patterns to improve our skills, and that is when we search and we are faced with beautiful patterns and what we can do with great ideas of patterns. Do not forget to also take a look at our other wonderful patterns available to you. Here as they speak is a crochet paradise. Today I bring news and a new standard for you with a video tutorial and a step by step written with all the information on how to do it. It is very nice and easy to do because this pattern is beginner level. This pattern brings joy to you and can be used in many types of pieces! Mixing beautiful colors of crochet so leaving a result of wonderful pieces. 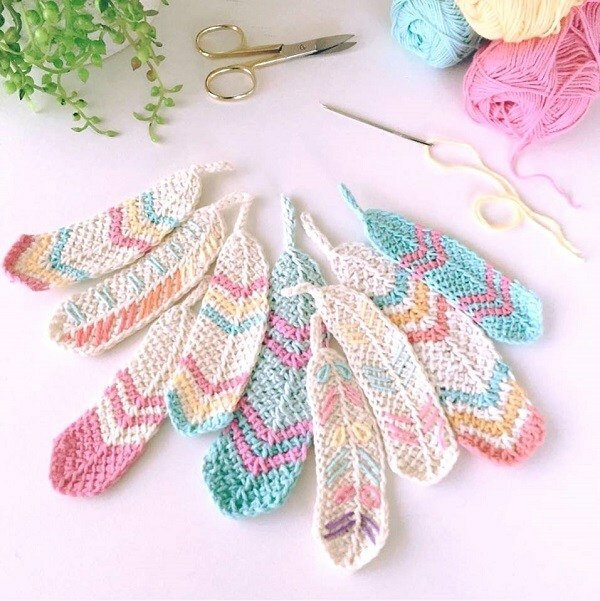 The crochet pattern of this post is about Crochet Feathers, this pattern is simply perfect for being so real, we were completely in love with the result and I'm sure you will too. And even more it being a free pattern is not really, we always want news and even more free. It's a Michelle Robinson pattern. And even more it being a free pattern is not really, we always want news and even more free. It's a Michelle Robinson pattern. I love how the feathers give an air of lightness and joy, is not that they participate in the dream filter, a beautiful decorative accessory that increasingly gains its space in the decoration with crafts, being modern and charming. I've always wanted this pattern now I'm here sharing with you. Do you love design with feathers? 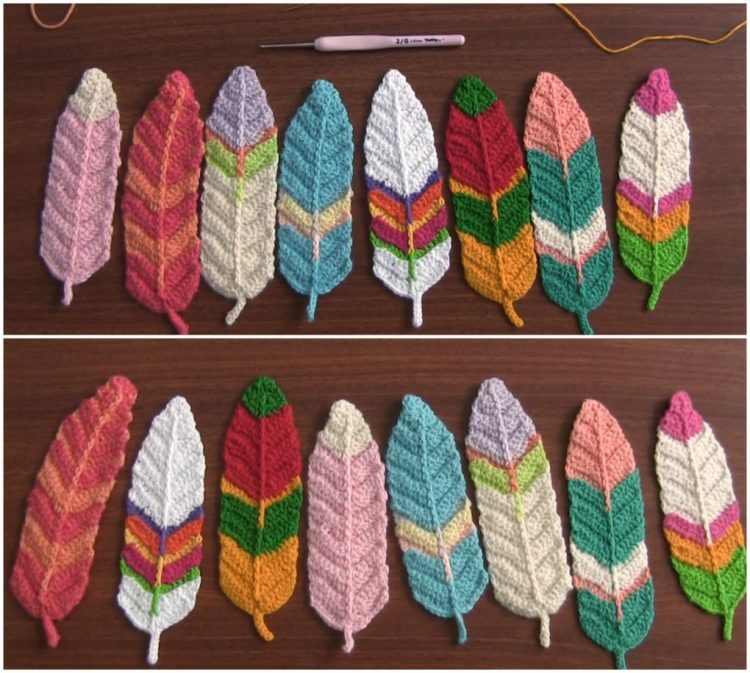 So I bet you will love this pattern that I brought to you, you will fall in love after seeing these feathers made of crochet. The feathers are used to adorn fashion pieces for a long time. They are used to decorate hat, blankets, used hanging on the dream filter, on blouses and also for decorating bags. Feathers have a freedom not only in their meaning but also in the way they do. You can make the color you prefer, being a single color or making them of more colors getting even more beautiful the colorful and is beautiful to do. Can do with warm tones or lighter tones as I left in the photo with pink white, you can use light tones that gets very delicate. Anyway use your favorite colors and do beautiful work. If you were looking for some new idea of crochet being something special for your home or give as a gift then you have found. Beautiful and decorative pieces can be seen on both sides. You can also use in addition to ideas that I left here, can use as bookmarks or locksmiths, there are many types of projects that you can do with feathers what you want and imagine. Below I leave you the link of the feather pattern with the step by step written to better understand and soon after I leave the video tutorial to remove all the doubts and to improve even more his ability in the feathers. Hope you like it.